This is 45 Auto Remington Golden Saber Bonded 185gr. Brass Jacketed Hollow Point Ammo. 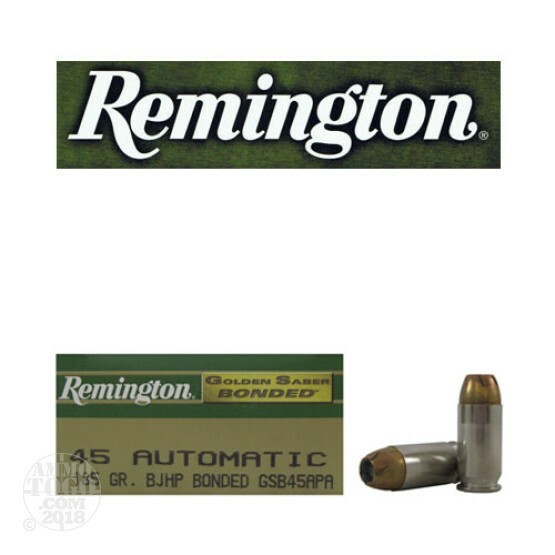 The Golden Saber High Performance Bonded Jacketed Hollow Point handgun ammo showcases Remington's continuing advances in bullet technology. No other handgun cartridge offers so many high-performance features for home security and law enforcement applications. Some of these features include: A nickel plated case for smooth functioning in all types of handguns. An exclusive bonded brass bullet jacket which controls mushrooming and releases energy over a longer distance, compared to copper jacketed bullets. The nose cuts of the bullet go completely through the bullet jacket to enhance mushroom initiation over the widest ranges of practical velocities. The reduced nose diameter greatly increases accuracy over a wide range of distances. The primer and case mouth is sealed for moisture protection and the primers are triple checked during the manufacturing process, to ensure the most reliable functioning handgun ammo manufactured. The powders are treated with flash retardants to greatly decrease the amount of muzzle flash. This is a premium personal protection and law enforcement round. It is brass cased, boxer primed, and non-corrosive. This ammo is packed in 50rd. boxes, 500rds to a case. Muzzle Velocity: 1015 FPS.